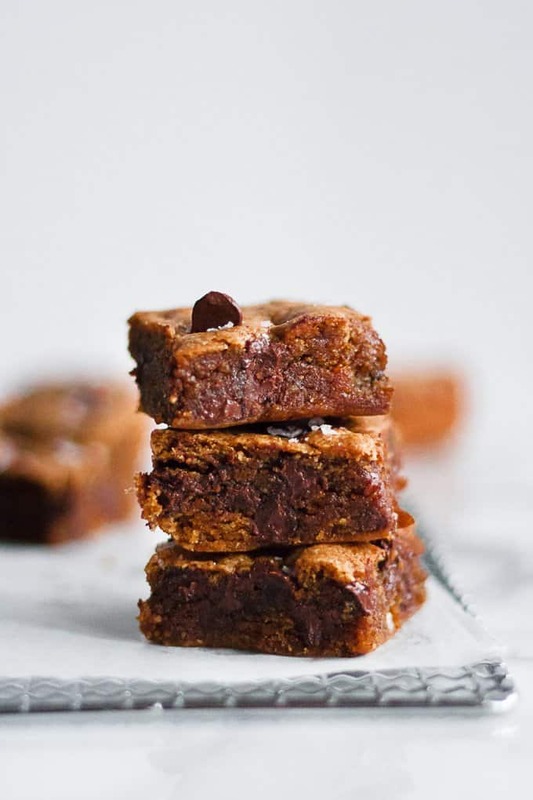 Paleo chocolate chip granola butter blondies that are gooey, salty, sweet, and have puddles of chocolate in every bite. They will be your go-to sweet treat for parties, or whenever you need a blondie fix! As I close out my month of Food Freedom recipes, I decided to share a sweet treat with you! Sugar in any form is something that is not allowed on Whole30 and something we should all be a little more aware of in our daily lives. 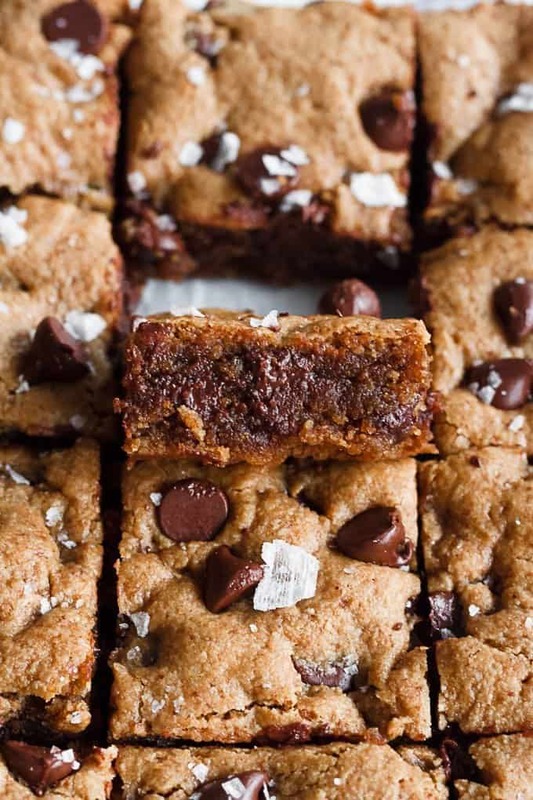 And these blondies, while definitely sweet, are refined sugar free – sweetened only with coconut sugar and granola butter. If you curious, which I know you are (!! ), granola butter is a delightfully sweet ‘nut butter’ made from blending a bag of my grain free granola down until it forms a nut butter consistency. And yes, it is as good as you think it is! I have been baking with tahini (which I adore) for a long time; but I just knew granola butter would hit the spot! 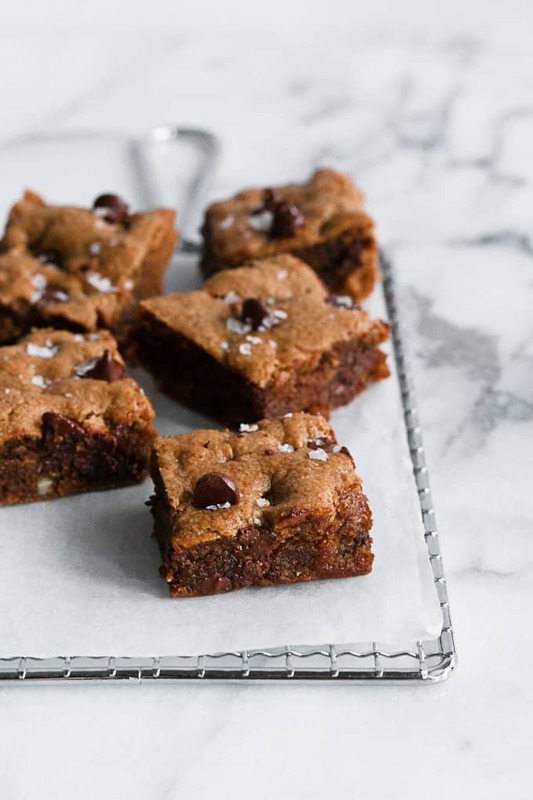 Plus you really cannot go wrong with granola butter blondies, studded with chocolate chips, and sprinkled with extra flaky sea salt. Oh and you should know that these are definitely better under baked. See that gooey middle? Yea that’s exactly the texture you want for these paleo granola butter blondies. The base of the dry ingredients is almond flour. 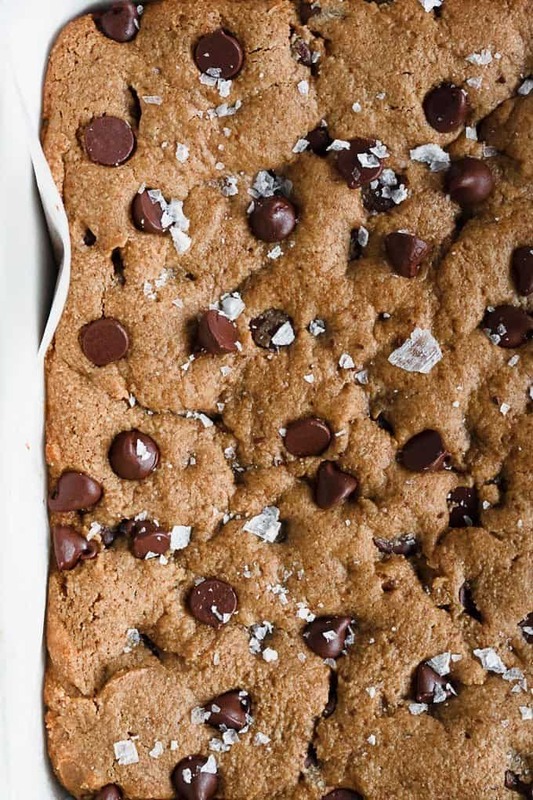 And when baked fully or just slightly over baked, almond flour tends to produce a more cakey texture… which is perfect in some cases, but not for blondies! And if you want to pick up a bag of granola so you can make your own, you can shop my granola here use the code BUTTER15 at checkout for 15% off! If you have a sweet tooth like me, I hope you try these paleo chocolate chip granola butter blondies, whether you are reintroducing foods post-Whole30 or exploring your food freedom! When you make this recipe, remember to tag @imhungrybynature on Instagram! Preheat oven to 350 degrees F. Line a 8×8 inch baking pan with parchment paper and spray with nonstick cooking spray to prevent sticking. Set aside. In a large bowl, mix together the eggs, coconut sugar, granola butter, coconut oil and vanilla until smooth. Add batter to the prepared pan and spread evenly. Bake for 18-23 minutes until edges are just slightly golden. We want to slightly underbake these so they stay gooey. 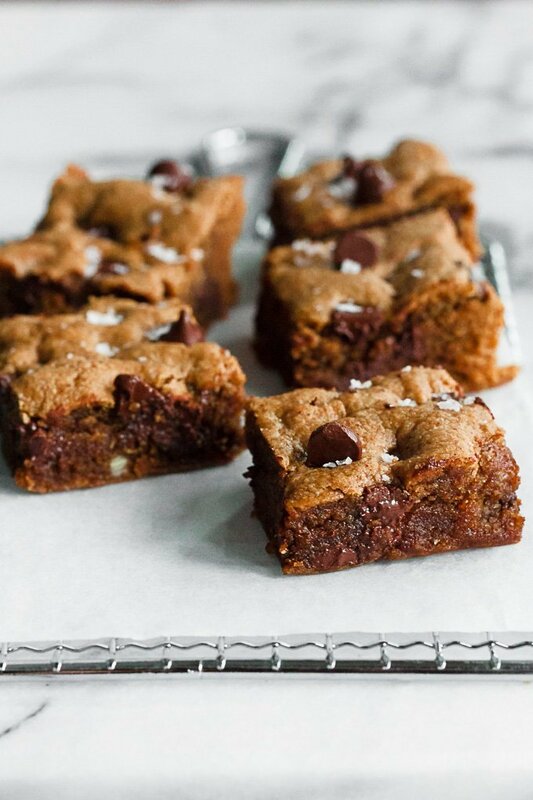 Once done baking, immediately sprinkle with Maldon salt; remove blondies from pan after 15 minutes. Cut into 16 bars and serve! Thank you Danijela! I hope you give them a try!